In hindsight, I was mistaken about the scale of the problem in this article. 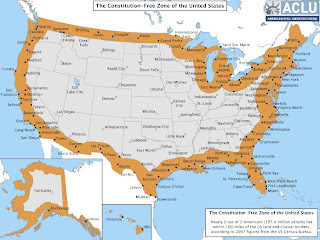 It turns out the entire country is actually a Constitution-free zone and has been for over a century, with certain Amendments respected (although with limitations) in an effort to maintain the illusion of "freedom." Carry on. Attention, citizens. Please check the chart below to see if you still have your 4th Amendment rights. All those living in the orange-shaded areas are no longer protected from unwarranted searches and seizures of their property. While the media has remained mostly silent, the Department of Homeland Security has declared that it can seize any electronic device without probable cause within 100 miles of our borders. However, DHS has defined the "borders" as any natural barrier, physical or political, including bodies of water. 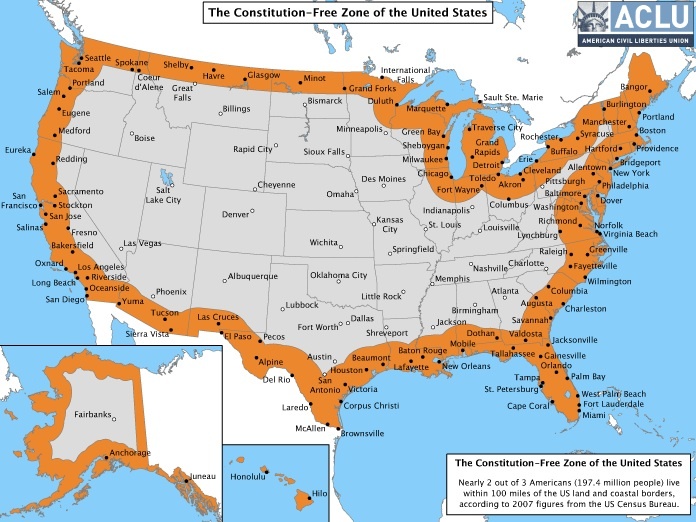 This "Constitution-Free" zone extends 100 miles inland from our northern and southern borders and east and west coasts. As a resident of Philadelphia, I would no longer be protected by the 4th Amendment, nor would about 150,000,000 other Americans in other cities. "We also conclude that imposing a requirement that officers have reasonable suspicion in order to conduct a border search of an electronic device would be operationally harmful without concomitant civil rights/civil liberties benefits." Basically, allowing you your 4th Amendment rights is being dismissed as a threat to national security. Even the ACLU is claiming that "as a minimum," officers should need probable cause. Between 2008 and 2010, 6,500 people had their electronic devices searched along our border. This includes laptops, tablets, cell phones, cameras, hard drives, flash drives, DVDs, and others. In 2010, a man's laptop was confiscated at an Amtrak inspection point along the Canadian border. Mr. Abidor. After being told to enter his password, the federal agent found pictures of Hezbollah and Hamas rallies. Despite informing the agents that he was earning a doctoral degree in Lebonese-Shiite history, Mr. Abidor was jailed for several hours and questioned by a number of different agents. Mr. Abidor was eventually released, but his laptop was kept for almost two weeks before his attorney got it back for him. The ACLU has filed a lawsuit regarding the case. 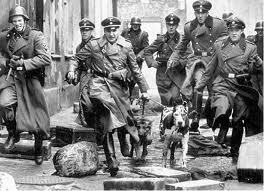 Judging by our government's tendency to expand its powers in the name of national security, this sets down a dangerous precedent: if the Department of the Fatherland can arbitrarily suspend one constitutionally-protected right, there's nothing to stop it from suspending our right to free speech, or our protection from cruel and unusual punishment, for example. All for national security. Combine this with the Patriot Act and the National Defense Authorization Act (which allows for the indefinite detention of a citizen on the order of the President without charges or a trial), and you can see that all the check and balances that our Founders created to protect the people from a tyrannical central government have been ignored or outright destroyed in the name of "security." It won't be long until they're in our homes performing "routine inspections" to keep us "secure." America's death zones hits map of the United States takes into account all of the gun related deaths since the Sandy Hook school shooting. You’ll likely notice about death zones hits that there is one common denominator. The majority of the violence has occurred in major metropolitan areas, with some incidents spreading into outlying ex-urban and rural areas. As of this writing 2,244 people have been killed since December of 2012 where death zones hits on america. And you will further notice all major metro areas have the strictest gun control and the most gun free zones.